Natsuo Akazawa wants the world to rethink robots: what they look like, where they live, what they do, and even how they’re made. Akazawa is well on his way to achieving his dream of developing a new kind of robot, produced in what he calls a “futuristic factory.” He’s the president and representative director of PLENGoer Robotics, which will ship its first product, a service robot called PLEN Cube, later this year. PLEN Cube isn’t meant to live in a factory, but in your home or hand. It's an expressive but powerful hybrid of personal assistant and portable companion. Akazawa’s futuristic factory is fueled by 3D printing. 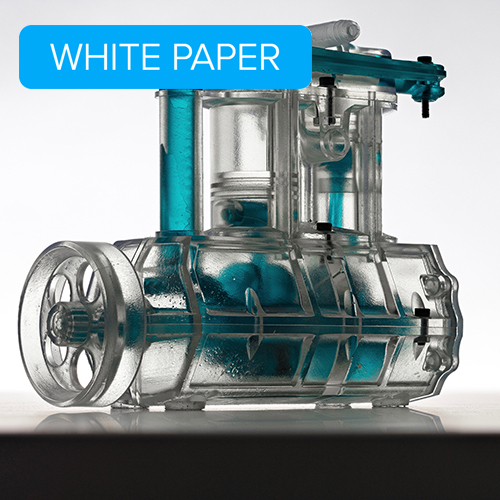 Team members across countries coordinate designs in real time over cloud-based CAD and prototype in-house using desktop stereolithography (SLA) 3D printing, saving upwards of 85 percent in time and costs for some components. Ultimately, this digital design process inspired the company to rewrite and revamp its product development strategy. Continue on to read more about what Akazawa and his team learned throughout the design and product development process for PLEN Cube, and how they’ll hard-wire these lessons into their work moving forward. PLEN Cube’s appearance is essential to its success, so the ability to rapidly prototype and test its enclosure and the mechanics that enable it to move proved crucial to the development process. 3D printed enclosures were also used in the prototypes for videos and crowdfunding. PLEN Cube moves in various ways to communicate. The ability to prototype the robot’s friendly appearance and set of movements was crucial to a successful final product. The PLENGoer Robotics team understood the value of in-house 3D printing for fast, cost-effective, prototyping and initially started with an fused deposition modeling (FDM) system, but found that it couldn’t fully replace outsourcing. “The biggest problem was lack of measurement precision. In the end, the prototype output with the FDM 3D printer could be shown only as a rough prediction of the final product, and in the final stages of the prototyping process, parts were produced through outsourcing using an SLA 3D printer in order to ensure correct measurement precision and finishing,” Akazawa said. Designing for proper tolerance and fit lowers post-processing time and ease of assembly, and reduces the material cost of iteration. The PLENGoer Robotics team use the Form 2 SLA 3D printer to save time and costs for iterating and testing components of PLEN Cube. Right off the bat, PLENGoer Robotics saw significant cost savings from 3D printing in-house with the Form 2. Directly printing a prototype of PLEN Cube’s outer casing resulted in a cost reduction of 95 percent compared to outsourcing a CNC-milled master. Plus, production time was reduced by about 86 percent, taking only two days instead of two weeks. “In the case of outsourcing, we can’t make multiple prototypes on each occasion. The great advantage of the Form 2 used in-house is that we can repeatedly carry out tests,” said Kazuya Shibata, an engineer at PLENGoer Robotics. In-house 3D printing also helps Shibata coordinate with colleagues in China and Ireland. 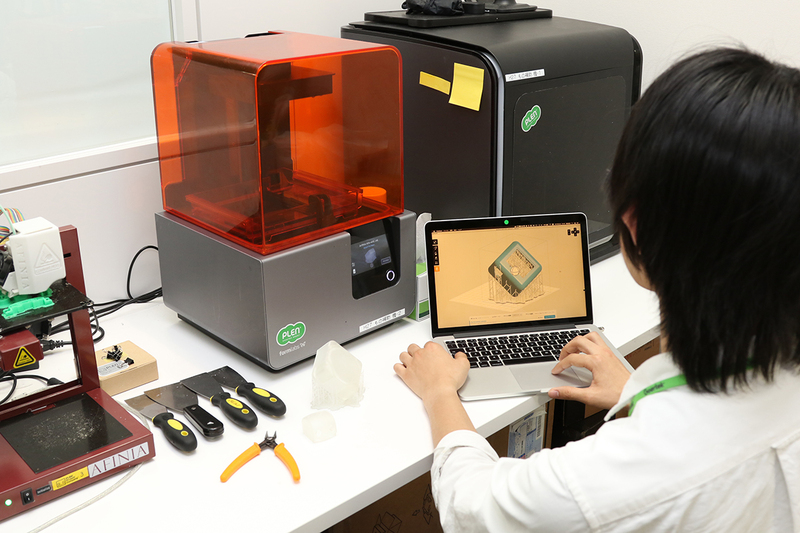 Engineers across offices merge design data using cloud-based Autodesk Fusion 360 software, then, in Japan, Shibata prints designs over Wi-Fi on the Form 2 to evaluate and share with the team. Soon, they hope to integrate Form 2s in every office. The PLENGoer Robotics team plans to take the product development and prototyping processes they experienced with PLEN Cube and systemize them into the roadmap for future products. 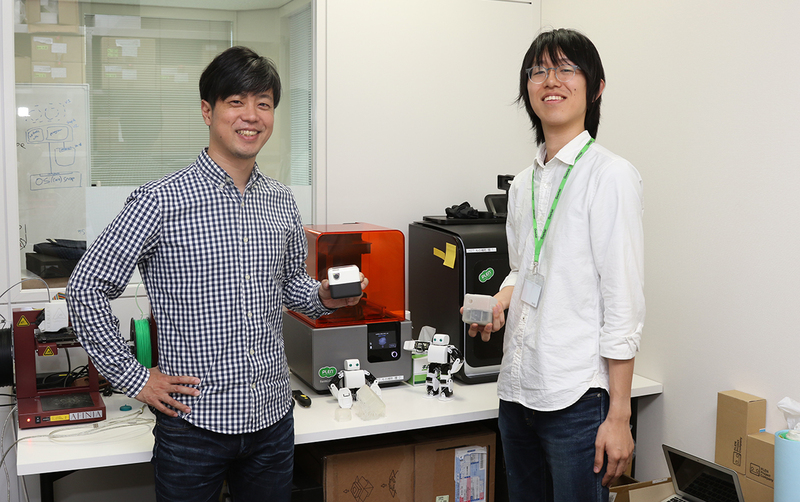 Natsuo Akazawa and Kazuya Shibata, PLENGoer Robotics’ president and engineer, hold PLEN Cube prototypes 3D printed on the Form 2. Akazawa and Shibata transitioned from FDM to SLA 3D printing in order to produce the precision of machined parts in-house&ndash;without the costs or wait time. See what’s possible with SLA 3D printing for yourself: choose from more than 10 unique sample parts and we’ll send one straight to your door.